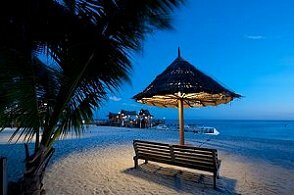 Sipadan Mabul Resort is a luxury resort located on south-east side of Mabul Island and is overlooking nearby Sipadan island. 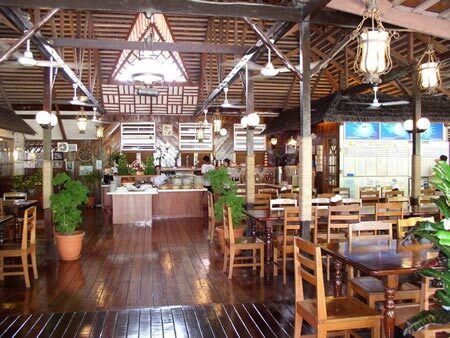 Sipadan Mabul Resort is nestled in a coconut grove and offers beautifully designed wooden air-con chalets builts next to a beautiful strech of white sand beach. The resort has 45 chalets with 22 stand alone chalets and 23 semi-detached. 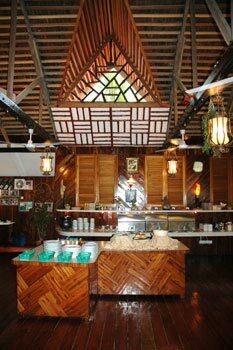 All the chalets are built with native Borneo materials, have ensuite bathroom with hot shower, air-con and mosquito screens. 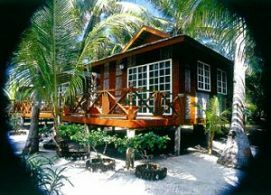 Sipadan-Mabul Resort is a PADI Gold Palm Resort. The dive centre at Sipadan-Mabul Resort features high quality dive equipment for rent and also offers technical diving courses for those interested in certifying with Nitrox or leaving with a TDI certification. There is even a course for budding underwater videographers with digital camera gear to rent to test out new skills and ensure your muck diving memories last a lifetime. SMART-TEC dive center offers Nitrox Air and Technical International (TDI) Certification Courses. The TEC center is perfect for Technical Divers diving the waters of Mabul or Sipadan and offers full Cave Diver courses and guided dives to Sipadan's famous turtle tomb. A filming and underwater video center can provide underwater videography services and courses. 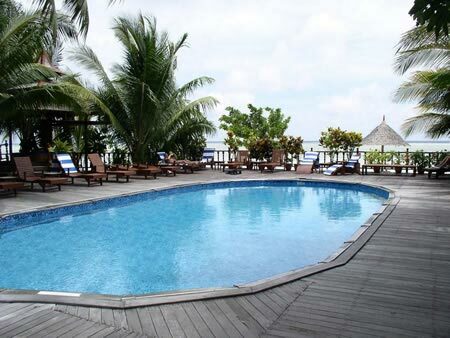 Sipadan Mabul Resort dive centre is well equipped with over 180 aluminium tanks along with 4 Bauer compressors. 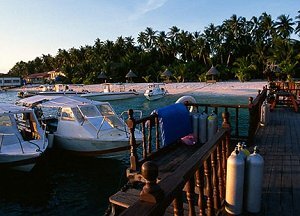 Sipadan Mabul Resort uses six custom built fiberglass dive boats able to carry 10 divers each and get to any of the island dive sites in about 15 minutes. Each boat goes out 3 times a day. At SMART Divers Resort, you NEVER carry a heavy tank, not even a few metres. The area surrounding Sipadan-Mabul Resort offers some of the highest-rated muck diving sites around, and with 3 guided boat trips per day there are plenty of opportunities to get as many muck dives in as possible. In addition to daily boat dives, SMART offers unlimited dives in front of the Resort's jetty or at the house reef (inclusive of night dives). There is even the opportunity to do sunset dives and night dives and unlimited self-guided beach dives available. Each boat is accompanied by a qualified and knowledgeable Divemaster who would be happy to show the wonders of the local environment. For this and many other reasons, Sipadan-Mabul Resort is a solid choice for muck diving enthusiasts looking to explore the area. 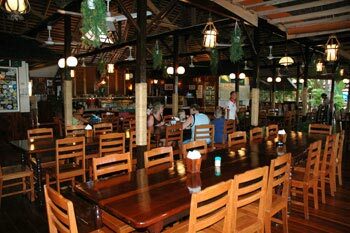 The restaurant is located under a large open air pavillion and is used for delicious buffet style meals and sometimes shows. A selection of fresh juices, coconut drink, sodas, beer and wine can be purchased at the resort bar and jetty bar. Buffet breakfast consists of cereal, toast, tea, coffee, fruits, eggs, porridge and asian dishes. Other resort facilities includes a swimming pool, a jacuzzi whirlpool spa, the dive centre which provides diving, snorkelling and ocean kayaking equipment for rent, spa and massage services, broadband internet access, a bar, a souvenir shop, video services, 24h staff on call and tour desk. 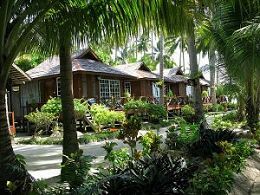 There are 45 beautifully designed duplex chalets: 22 detached (stand-alone) and 23 semi-detached chalets on offer at the Sipadan-Mabul Resort as well as one suite chalet. 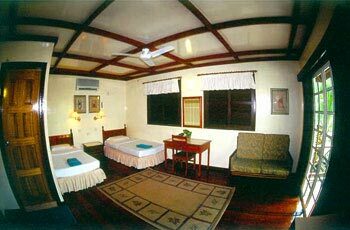 All accommodation options come equipped with air-conditioning and ceiling fansalong with large double beds or single beds, traditional Borneo furnishings and en-suite facilities. The stand-alone chalets have completely private balconies with ocean views and are similar to a small, stand-alone house ideal for couples or a family getaway. A total of 23 semi-detached chalets are available on the resort and are located in neighbouring pairs with private rooms and balconies on either side of a shared wall. The exclusive suite is of course much larger than the stand-alone and semi-detached chalets, and boasts a living room in addition to the luxurious bedroom and private balcony. All rooms come with air-con, two oversized single beds, ceiling fans, mini-bar, couch, electric point (220V), flyscreened windows, ensuite bathroom with free-flowing hot and cold water, front verandah. 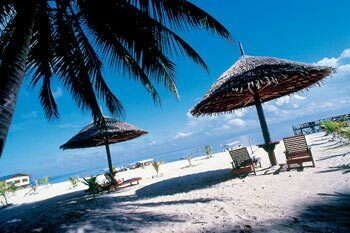 Note: Please take note that the permit to Sipadan Island is not guaranteed for shorter stays. Divers will be put on the Sabah Parks waiting list. 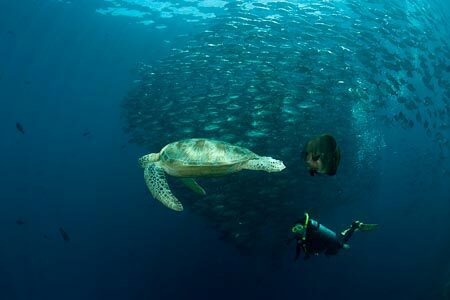 Chances for diving Sipadan are higher if the guest stays longer (2+ nights at least). 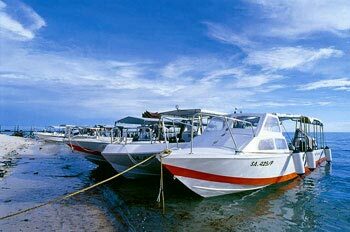 Should the Sipadan permit not been approved, Sipadan Mabul Resort can offer alternative diving at nearby islands such as Kapalai, Mataking, Si Amil or Ligitan, where there are no restrictions. Booking is advisable at least 60 days in advance. Late booking is available subject to availability. Book your reservation online to receive a special discount.